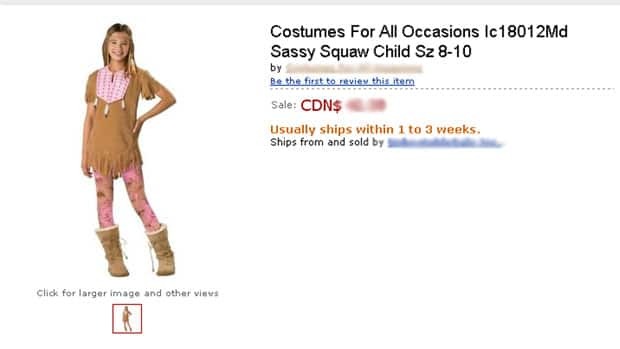 U.S. company says it chose kids' costume name because it was catchyA U.S. company is pulling a children's Halloween costume it called "Sassy Squaw" after CBC North made inquiries about its name. The costume for young girls featured a hide dress, feather hairband, beaded necklace and pink leggings with what look like ancient cave drawings. It was being sold at Sears.com and on Amazon.ca. The costume was designed and manufactured by a San Diego-based company called Incharacter. Their other costumes based on aboriginal culture include Cheeky Cherokee, Indian Brave and Maiden and the gruesome kids costume Spirit Warrior. The designers said they chose the name "Sassy Squaw" because they thought it was catchy. “It gives a primitive view of what aboriginal girls and women are all about,” she said. “There’s a lot of change to try and get away from the basic standard stereotype which we have been subjected to all this time, and this stereotype is actually dangerous now because it's affecting our aboriginal women and girls.”Comment: That's one costume down and thousands, perhaps millions, to go. Apparently the company pulled only the "Sassy Squaw" costume, and only because of its name. There's no evidence it pulled the other stereotypical costumes. Still, it's good that the company responded without a lot of whining about how innocent and fun its costumes are. That alone is a step forward. For more on "squaw," see "Squaw Bury Short Cake" and Tomahawk Tassels Stereotypes Native Women.